Today the Journal of Pediatrics issued a study called "Management of Food Allergy in the School Setting". Here is a short video on the study from CNN. 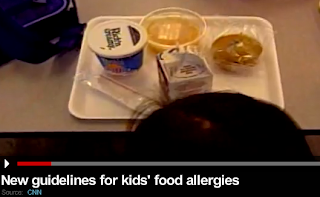 If these statistics quoted -- that 1 in 25 kids has a severe enough food allergy that could put them in the hospital, then it appears that food allergies are finally reaching a "tipping point" so that the medical community needs to start setting some standards in schools. Yay. Here's the page of the report with the short description, and on the right hand side you can link to download the whole pdf, which I'll do later today.